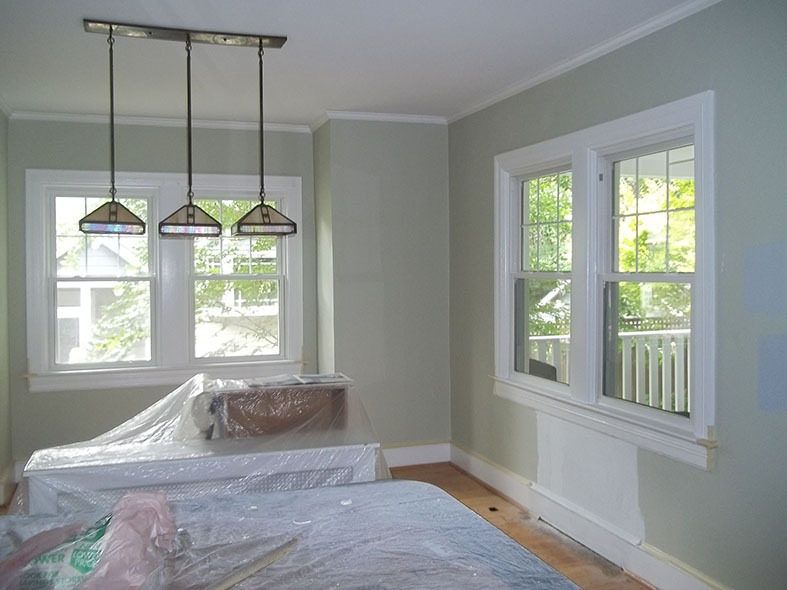 Repainting the interior of your home with a fresh coat of paint is a relatively straightforward task for most Home Owners. 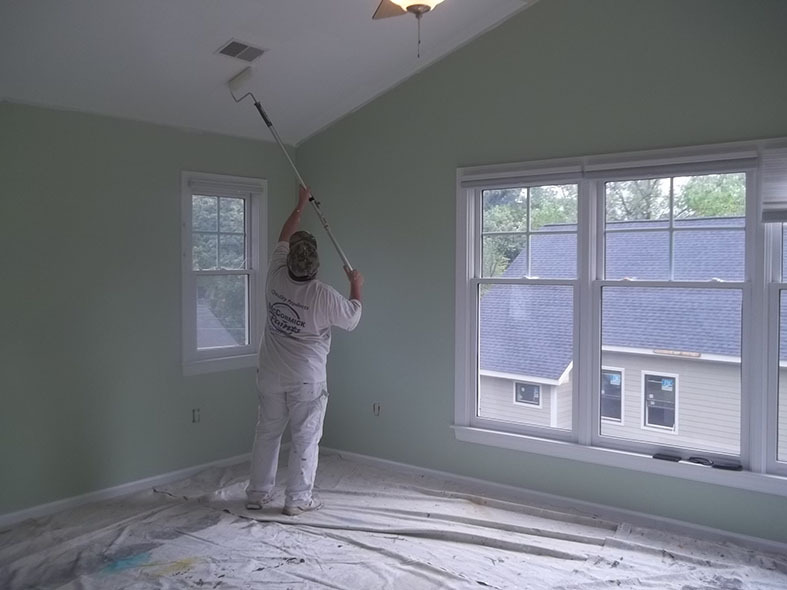 The job is even easier if the drywall and previous layer of paint that you are painting over is in relatively good condition. More likely than not, your home has been lived in by adults, children, and pets, and your drywall has a multitude of imperfections, perhaps even holes. Whether from installing fixtures or furniture moving mistakes, drywall holes happen to even the most careful homeowners. If the drywall shows signs of damage or wear and tear, then repairing the issues first is important in order to get museum quality painting results. If it’s a small repair, you should be able to repair your drywall quickly and then your new walls will be ready for painting in no time. You should first consider the size of the hole that needs to be repaired first before you grab a putty knife and start spackling. Extensive drywall damage will sometimes require knowledge and quite a lot of work to ensure the stability of the wall and affected area. On the other hand, a small crack or hole can usually be repaired in just a few minutes providing you prepare the surface and utilize the correct type of compound. We refinish drywall everyday and hopefully this blog post will give you some insight on the overall process of fixing the most common types of cracks. 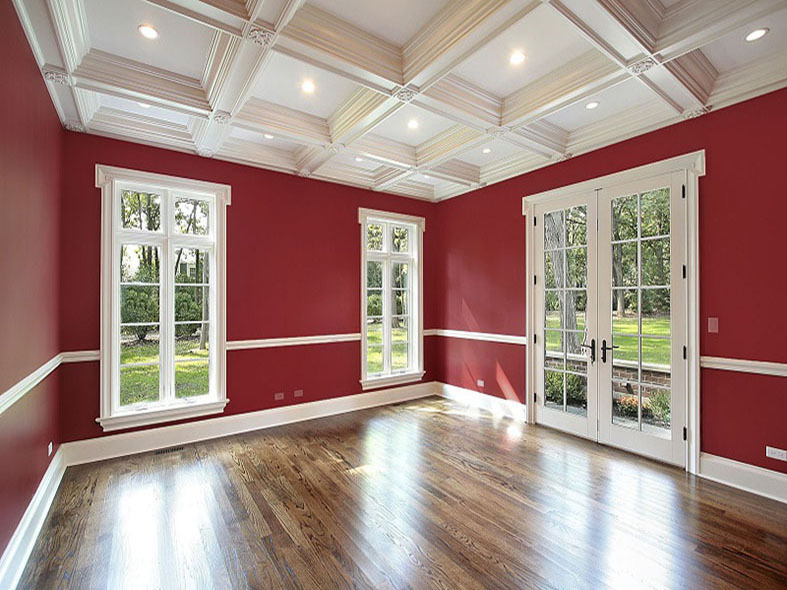 These are common occurrences for both ceiling and wall drywall surfaces, and are caused by a slight shifting framing of the house which is related to the weather and changes of the seasons. For minor nail pops the solution can be as simple as recessing the nail head and applying at least two layers of compound over the surface. In some cases, nail pops that occur in ceilings may require the removal of the existing screw and then the re-installation of several new fasteners around the affected area. Although most small cracks in walls are innocuous, certain stress cracks can be a recurring problem are most commonly repaired with a nylon mesh tape and multiple layers of compound. More aggressive cracks can sometimes necessitate the application of a fiberglass mesh or a high performance bonding material like Plaster Weld. Hairline cracks in drywall can be caused by normal house expansion and contraction, misplaced drywall joints, or the application of joint compound during inclement weather conditions. It is most common to see hairline cracks in older homes, however, these types of cracks can also develop in houses that are less than 3 years old. Most small holes are caused by people living within the Home and are the result of staples and picture hooks placed in the walls. Luckily, hairline cracks and small holes in the walls can be fixed without much effort. The important step to be aware of is to be sure that the hole and crack are at least one millimeter below the rest of the wall surface. The hole may need to be pounded in slightly to avoid the buildup of compound and a resulting bump or bulged out look on the wall. These problems can come about for any number of reasons, including the installation of a new fixture, or simply bumping a doorknob or chair against the wall. 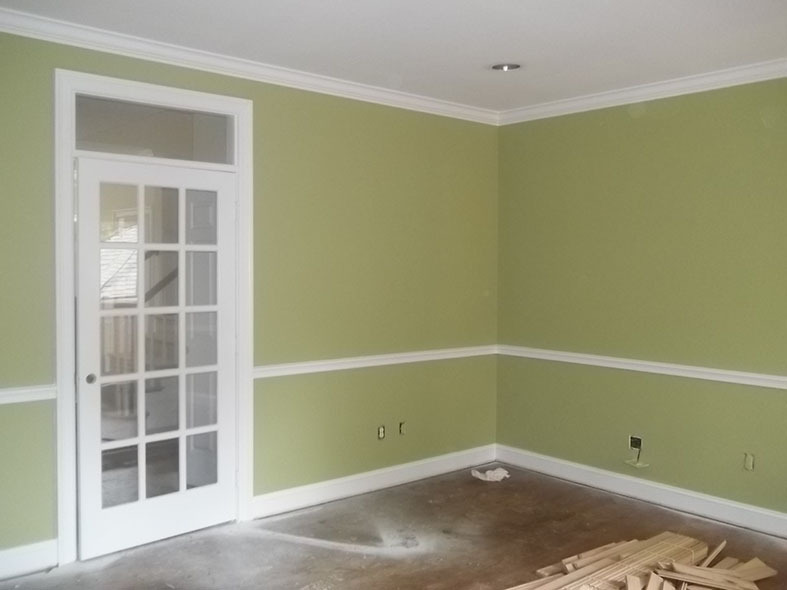 Depending upon the severity of the damage, the repair could require up to three drywall refinish stages which is codified as a level four type of refinish application. 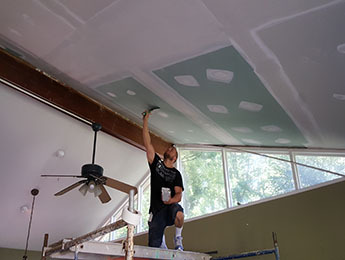 Under most normal circumstances, two or three skim applications of fast drying drywall compound which provides excellent bonding and resistance to cracking. Even though it is impossible to repair drywall without some sanding sanding, the goal is to do as little sanding as possible. We recommend Easy Sand 45 Compound as it is easier to sand if applied properly, and enables several applications to be distributed over a short period of time. 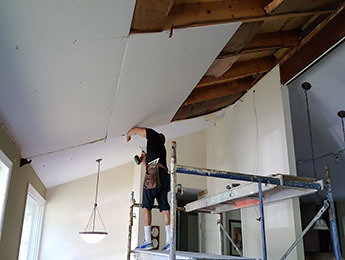 Large drywall holes that require drywall replacement are often the result of some accidental or deliberate break in the drywall. Typical drywall damage that is large includes water damage caused by a leak, bathroom fixtures that are removed or replaced, and electrical wiring that has been redone behind the wall. If the damage was caused by water, it is important to find and fix the source of the leak before beginning the drywall repair job. Frequently the solution involves more than one drywall tape application or perhaps even the replacement of a drywall section. The replacement would be followed-up with a single block application, sanding, and two skim coat applications utilizing ProForm Taping Joint Compound. Needless to say, this type of repair job can take days to complete because of the drying stages, and it definitely requires a good deal of craftsmanship and experience. 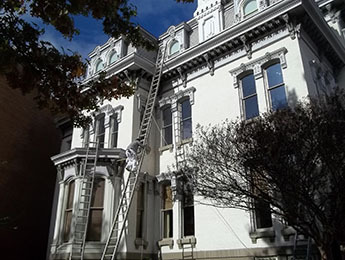 HOAs and Restrictive Ordinances are designed to protect neighborhood property values by enforcing Homeowners to maintain their home and not to deviate in terms of paint colors or architectural changes. Sometimes however, the bureaucracy of the HOA can be a little overwhelming. I’ve heard of stories of homeowners being sued by their HOA simply because they painted their shutters red instead of green. So the front of your house needs to be re-painted or your vinyl siding needs to be power washed. Should you ask permission from your HOA before doing anything? There are some HOAs that will require homeowners to hire an “HOA Approved” painting company. The most moderate HOA’s will limit color choices for an exterior repaint to three or four acceptable neutrals colors. 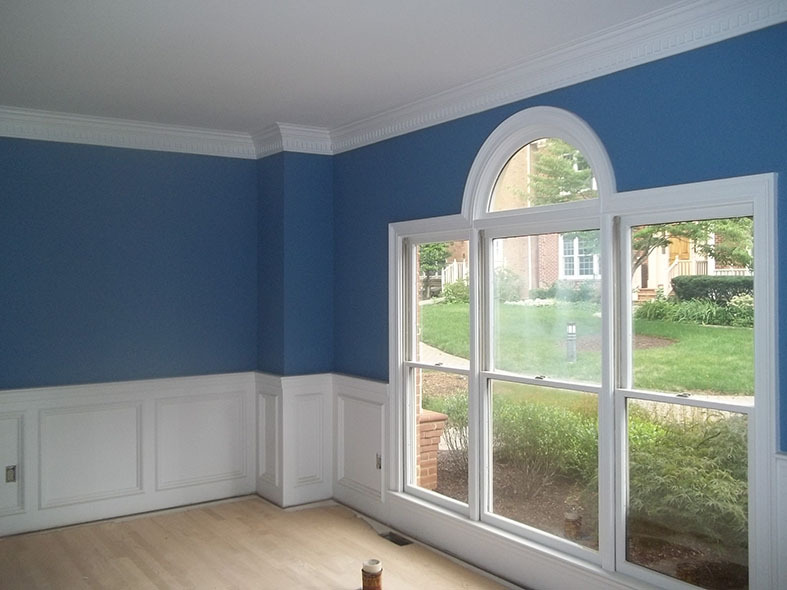 If for some odd chance the homeowner would like to deviate from the approved list of colors, they must go through a color change approval process. This could involve submitting paint samples, provide paint manufacturer and brand information, and possibly even attend architectural HOA board meetings. There are always obvious constraints. For example, if your next door neighbor had the exact same color that you would like to apply, then there might be an objection. Some HOAs rules do make sense in terms of paint schemes. Colors should be in the same schema when you take into consideration the siding color, trim color, garage door, front door, and shutters. Often times, they will regulate the brand of paint that you use to be the same builder brand and quality. All of these pesky rules and regulations should be included within the By-Laws of the HOA. >As a homeowner within an HOA Controlled Community, you should take these regulations seriously, and always inquire with the Board if you are thinking about making changes to the exterior. Trust me; HOA’s have their ways of forcing homeowners to comply with their demands. As stated in the By-Laws of the HOA, usually they are able to fine homeowners several hundred dollars per month. If the fines get ignored, they can then place a lien on the property thereby forcing the homeowner into submission. It's important to document everything whenever you're dealing with the HOA. For example, if someone complains about your color choice years down the road, it's a good idea to keep a paper trail concerning your color approvals. Paint colors on the inside of the home should never become an issue with the HOA in your neighborhood. 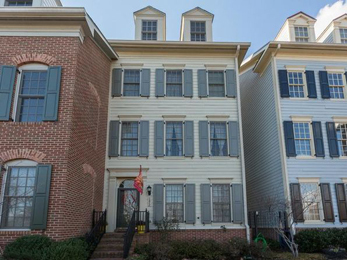 Davinci's Painting has been dealing with HOA's in Reston since Reston was built! Please give us a call if you should need any assistance.